This is a rr block from our RMCQ group. I did a BE seahorse, lobster, seashell, starfish, ruched ribbon seaweed and featherstitch behind that. I then created some cast on flowers for some sea "flowers" and color and did border treatment in....cretin I think! LOL!!! Have to look again. Anywhoo....enjoy the eye candy! Guess I must be at once a week posts or somthin'! LOL!!! I'm in 4 rr's and feeling a little pressured...don't know why...anywhoo...heres the work I did on the UTS block from a person in the CCQI group I belong to! I did the jellyfish, the coral's with the pinkish type flowers in BE and the orange one's in BE, the rock with the BE lobster, star flower in detached chain stitch and the drizzles. I also added a little sea horse charm. Had to stop somewhere....it's so hard to figure out what's too much or too little in rr's cuz, at least I, tend to take the block on as my own and want to keep on working! :_) Anywhoo...hope everyone likes it! little flap, the other open to slide a packet of needles into along with the felt to poke the needles into. This is my very first needlecase....I think it turned out pretty good. Hopefully the recipient will enjoy it! Don't know how to rename this sucker now that it's downloaded, soooo, i'll just say here that this is the back of a needlecase I just made for an exchange I am participating in. Been a busy couple of weeks of stitching! 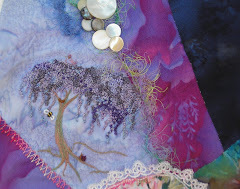 I have definitely mastered the french knot after this wisteria tree! I also added the seam trimmings of combo cretan/herringbone stitch on one side, the lace trim for the fan below, (not really visible cuz I was focusing on the tree) and eyelash trim swirled along the opposite seam with mops above. I added a little BE bee and snail also..don't think they are visible either cuz they are so small. Anyway....one block down, three more to go in the war of rr's!